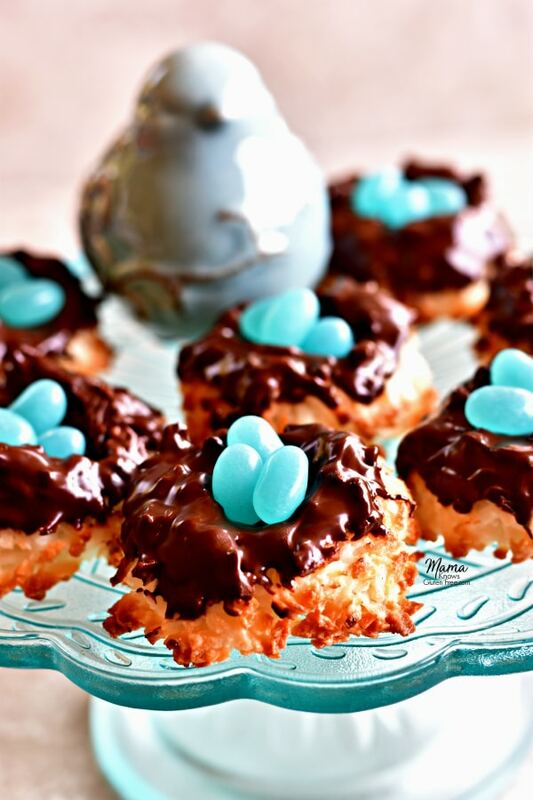 Coconut Macaroon Nests. 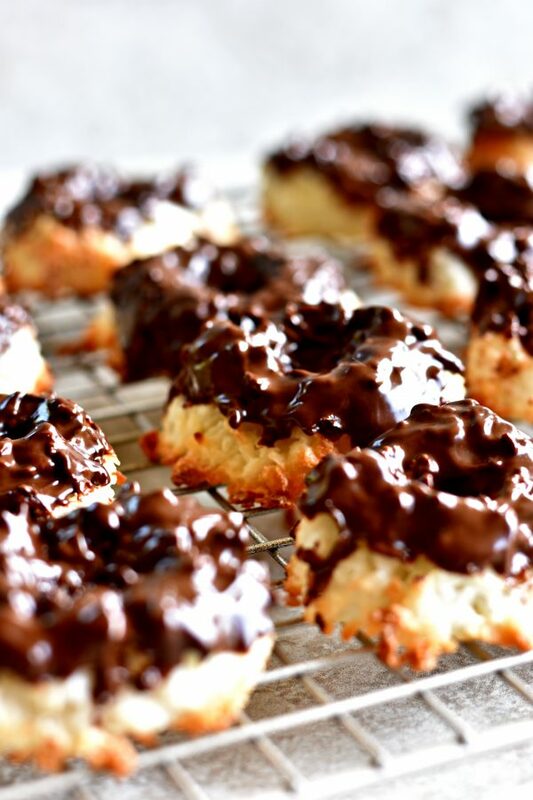 Easy coconut macaroon cookies that are chewy and dipped in decadent chocolate. These coconut cookies are both gluten-free and dairy-free. Perfect for your Spring and Easter celebrations. Spring has finally arrived here in North Florida and it has me in the mood to do some baking! I love finding new and creative ways to make special treats for my kids. We have lots of birds nesting around our homestead and I was inspired by these little mamas to make bird nest cookies. Coconut macaroon cookies are a classic cookie that can be made so many different ways. I wanted a gluten-free and dairy-free coconut macaroon recipe. I also wanted a coconut cookie that would be thick and chewy but hold its shape in order to make a nest. I found the right balance of ingredients for the perfect coconut macaroon nests. One of my favorite flavor combinations is coconut and chocolate. Who doesn’t love a Mounds or Almond Joy candy bar, especially since they are both gluten-free? I knew that I wanted to smother these little coconut beauties in melted chocolate. 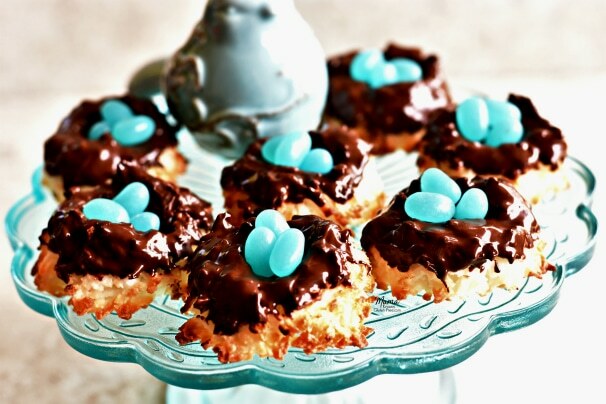 By doing so, the coconut macaroons looked even more like real bird’s nests. My kids had so much fun with me picking through the huge bag of Jelly Belly jelly beans to find all of the light blue ones. I bought the bag with 49 flavors, so it was fun to try the different colors and see if we could guess the flavors. It was a real treat for my kids. Jelly Bellys are also gluten-free, dairy-free, Kosher, egg-free and vegetarian. 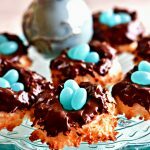 These gluten-free coconut macaroons nest cookies are super easy to make! It’s a simple coconut macaroon recipe that can be made in 30 minutes. These easy coconut macaroons cookies are chewy and a decadent treat. I just think they are so pretty and my kids absolutely adored them! They would be a perfect gluten-free dessert for Spring and Easter celebrations. 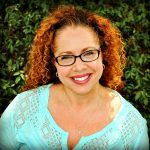 Here are a few of my favorite gluten-free recipes for the Spring. In a larger bowl with your mixer beat the eggs whites, cream of tartar and salt until foamy. Add the pure almond extract. Add the sugar one tablespoon at a time and continue to beat. Add the gluten-free flour one tablespoon at a time and continue to beat until stiff. Scoop out the batter using a medium-sized (1 1/2 tablespoons) cookie scoop and place on a parchment paper lined cookie sheet. Using the back of a rounded 1/2 teaspoon gently push down on the centers of the cookies to make a nest (you can also just use your finger). Bake for 18-20 minutes until the cookie edges start to turn golden brown. Please watch your cookies because all ovens are different. Remove from the oven and allow the cookies to cool completely before dipping them in the chocolate. In a microwave-safe dish melt the mini chocolate chips for 1-2 minute, 1 minute at a time. Remove and stir until the chips melt and are more smooth. If the chips are not fully melted put back into the microwave for another minute. Please watch the chips because all microwaves are different. Once the chocolate chips are fully melted add the melted coconut oil and stir. Dip each top of the cookies into the melted chocolate mixture. Allow the melted chocolate to dry a little before adding the jelly beans or your candy of choice. Recipe inspired by Coconut Macaroons from Betty Crocker’s 40th Anniversary Cookbook. Hi Kerry! You add the melted coconut oil into the melted chocolate chips. Thanks for catching that…I had chocolate chips twice. I corrected the recipe instructions. I hope you enjoy the cookies!